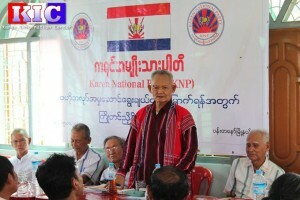 Following its officially registration with the Federal Electoral Commission, the Karen National Party (KNP) established an executive committee on November 15, 2014. The KNP’s, newly elected secretary, Mahn Kyaw Nyein, told Karen News that the executive committee will work towards getting its officers in charge of respective portfolio in place as soon as possible. The Karen National Party said they had established an executive committee that will now appoint members for each designated section, and those positions would include both men and women of all ages and would be recruited from different regions. Naw Sussana Hla Hla Soe, the director of the Karen Women’s Empowerment Group (KWEG) said that introducing and initiating a committee for the new Karen Party if it is working in the interest of the people was welcomed. The registration of the KNP means that there are five legal Karen political parties in Burma, these include – Phalon-Sawow Democratic Party (PSDP), Karen Democratic Party (KDP), Karen State Democracy and Development Party (KSDDP) and Karen People’s Party (KPP) – the only party set outside of Karen State, in Yangon. The Karen Nation Party (KNP) is the fifth legal Karen political party registered with the Federal Electoral Commission of Burma. PSDP is a member of the Nationalities Brotherhood Federation (NBF). KPP and KDP are members of the Federal Democratic Alliance (FDA) and KNP has recently joined UNA. The KNP’s elected 13 committee members are: Mahn Thein Shwe as president; Mahn Htain Win Sein, Mahn Ohn Maung, Saw Lun Tin and Mahn Tin Shwe as vice presidents; Mahn Kyaw Nyein as secretary; Mahn Min Ye Htwe, Saw Hsar Ta Paw, Saw Kapaw Moo and Mhan Kyaw Aye as assistant secretaries; Mahn Aung Myaing as treasurer (1) and Ghar Than Aye as treasurer (2) respectively. As many as 60 delegates from the Yangon Division, Bago Division and Irrawaddy Division attended the meeting hosted by the Karen National Party. During the meeting, they agreed to join the United Nationalist Alliance (UNA) and appointed Mhan Htain Win Sein, Mhan Kyaw Nyein and Mhan Min Ye Htwe as spokespeople for the party.